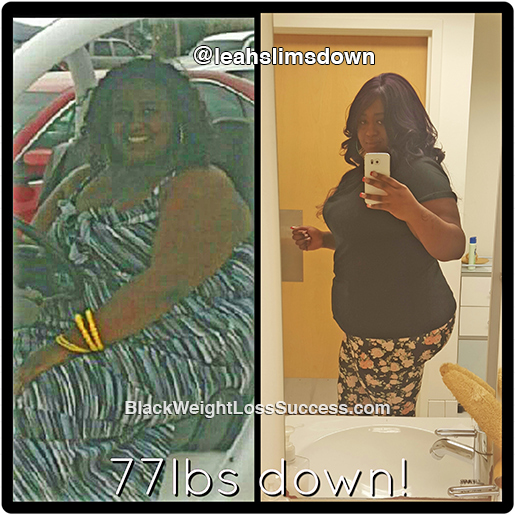 Transformation of the Day: Leah lost 77 pounds. She’s been battling obesity for 6 years. A low carb lifestyle, lots of exercise and a serious mindset change have helped her to change her life. Now, she’s on a mission and sharing her journey with the world. Check out how she did it. Obesity is a terrible disease. Even though I have lost 77 pounds, I still struggle with it mentally. I have been on this roller coaster of a journey for about 6 years now. After I had my son, my weight ballooned to 384 pounds or more. I tried endless diets, but they just didn’t stick. Over a year and a half ago, I got help from my Doctor and began taking medicine to stop my cravings. It helped, but when I stopped taking the medicine and the weight came back. I tried Plexus and it didn’t help. I also tried to stop eating and that didn’t help… LOL! So, I decided to do something that I’ve never done before. I ate low carb foods and used light weights and cardio for exercise. I worked out as often as I could and I didn’t give up! I cut out fast food, carbs, sweets, candy and soda. Anything processed was basically removed from my diet. I started cooking more, drinking protein replacement shakes and lots of water. I ate lots of veggies and chicken. It takes time to prepare my meals but it is definitely worth it. I workout 3-4 days a week at LA Fitness. Now, I plan to start using a personal trainer to finish up this journey. My efforts sure have paid off, because today I weigh 307 pounds, down from from 384 pounds. I don’t look it, because I am solid and I am pretty tall (height: 5’9″). My tummy is my BIGGEST struggle. I hate to put my weight out in the public eye, but it will hold me accountable and help me to get this done. I have finally figured out on my own what works for me! I’ve been on this journey for a solid 6 years, but the past year and a half is where I lost 77 lbs. My goal is to lose 80-100lbs more this year. My other dilemma lies in the fact that I have PCOS and low progesterone which makes it even 3 times harder to lose weight. I have been on a plateau for a solid 3 months, with my weight going up and down. However, one thing you will not find me do is give up on myself, because I have come way too far and feel way too good. My advice for others: Be consistent and don’t give up. You have to understand that it’s all in your mind and you can do whatever you put your mind to. Be strong! You are an inspiration to me. I know about POST and the struggle. Reading your story I am encouraged to try it again. Thank you. PCOS not POST. What low carb diet plan did you follow?